Focus maintenance efforts where they will have the biggest impact. Catch gradual control loop performance losses early. 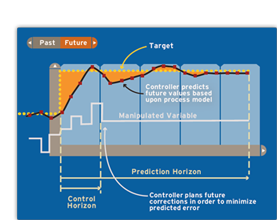 Help keep supervisory control systems online and maximizing available benefits. ControlTRAC Control Performance Monitoring Tools are fully integrated into Capstone’s PARCview information management system. The ControlTRAC performance reports can be generated on-demand and automatically on a preset schedule. The ControlTRAC server engine automatically identifies the process and loop state (shutdown, startup, low or high production, manual, etc.) without time consuming DCS configuration work. Automated, intelligent tag metadata analysis make the system setup virtually configuration free. ControlTRAC reports are easy to understand, quickly helping you decide if loop maintenance is needed. The overall control loop performance is explained in plain English at the top of the report and followed with detailed supporting information. Key performance indices include disturbance response, setpoint tracking, actuator linearity and control loop oscillation. On demand reports are available via PARCview trends. Users can simply right-click on a PARCview trend to access the loop performance reports. Scheduled analysis reports are available via web browser or they can be automatically deposited into a network directory or delivered via email.